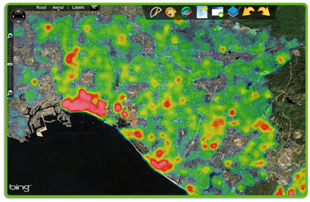 We’ve talked in this blog about how mapping in the cloud has gone mainstream. How cloud computing has turned the world of GIS on its head, bringing a flood of new users who don’t even know what GIS stands for, to our websites and desktop applications. It’s more critical than ever to pay attention to these end users and their needs, because they’re dramatically different from the traditional GIS user, and if we don’t understand how our customers are changing, we run the risk of losing them, just as they’re getting to know the virtues of mapping. A decade ago, the typical GIS user worked in a fairly large organization that had specially trained GIS staff to service the organization’s spatial requests. All this began to change as more and more industries saw the power of spatial technology and innovated by making intuitive mapping technology widely available to their organization. Then, when GIS moved to the cloud a few years ago, another huge shift took place – GIS moved beyond corporations and into our everyday lives with Google Earth™, Bing© Maps and Google Maps mashups. People were suddenly interacting with maps everywhere: on their mobile phones, iPads and other devices. This is incredibly exciting for the GIS world, but these new users bring a whole new set of expectations that geo-developers and GIS companies need to heed. While the new user likes maps, he couldn’t care less about GIS. These users know how to navigate and interact with consumer maps and expect all their interactions with spatial technology to be this simple. They don’t, in any way, want to “see” GIS or have to learn a new vocabulary of terms like vectors, georeference, buffer, and shapefile. They don’t want to wait, even a few seconds, for a map to load. Basically, they want to get to the information they’re seeking in a few clicks and without any training. They are hungry for new apps. The new user expects a constant stream of new functionality. They spend copious amounts of time on their tablets or smartphones searching for new apps and app updates. If you are not delivering regular new features and data, they might go elsewhere. Listen to your user, not other GIS experts. The paradox in GIS technology today is, as developers have made great strides in advanced geo-features and data, the end users’ needs have become more basic. Not only does your user not want to have to figure out how to use an application, he or she is increasingly accessing your app via a smartphone or tablet. Leave off the bells and whistles; keep the interface as simple as possible. Focus your energy on the user interface. The user interface is where you will find the biggest bang for the buck in satisfying these new users. Traditionally, GIS developers have not spent that much time thinking about the user interface. It was hard enough to get GIS working and by the time it was humming along smoothly, there was little time left for the UI. The bar for easy to use applications has been raised and investing in the interface will pay off handsomely. Be obsessed with performance: Your spatial application can never be fast enough. Perhaps more important than building in new features is doing all you can to keep things running smoothly and quickly. That means using every trick in the book to optimize data display and performance. Pay attention to visualization. Today’s end users like pretty, well-designed spatial technology. Using an intuitive color scheme like this one will help users immediately grasp what is going on with the data. And stick to a reasonable number of classes when you are summarizing your data. Once again, sleek and simple is the key. We’ve put a lot of emphasis on map performance and regular updates in the observations above, but don’t be intimidated. Spatial technology is actually getting easier to use every day, and more and more niche companies have come on the scene to help you with continuously updated data streams, speedy mapping functions, and robust and reliable spatial infrastructures. That frees you up to concentrate on those end users in a bigger way than ever before.